DTS8 Coffee Company Ltd (OTCMKTS:BKCT) Just announced that it had received a manual exemption in 44 US jurisdictions for Blue Sky. On the news, the stock rallied to a new 52-week high today hitting $0.18 before closing down 4.50% for the day at $0.17. According to a recent 8-K filing, the company has entered into definitive agreement to acquire a private US roasting company. The deal is expected to close on August 1, 2016 and is subject to closing financing and receiving audited financials. DTS8 Coffee Company Ltd (OTCMKTS:BKCT) has agreed to acquire the company for $4.5 million in cash or $4.7 million in a mixture of debt and cash. As of now, there is not expected to be any changes to the current management or operations. In China, where the company has a presence, the expanding coffee culture and the popularity of coffee shops in bigger cities is increasing the awareness and sale of fresh roasted coffee. Supplying gourmet, artisan roasted, coffees, fresh from our roaster located in Huzhou, positions us well in Shanghai to participate in the development and evolution of this new coffee drinking culture in all of China. Fresh, artisan roasted coffee is only available at a limited number of premium food service establishments. The opening of new coffee cafes and fast food restaurants has increased coffee sales in China due to the adoption of modern lifestyles and affluence within the country. The evolution in the taste and buying habits of Chinese consumers is creating opportunities for the continued development of a robust coffee market which bodes well for the Company’s future revenue growth. A few days ago at the end of March, BCKT received approval for listing in the Mergent Manuals and News Reports. Essentially this will boost the visibility and awareness of the company to outsiders. The listing will facilitate the trading of BCKT. Coffee securities in secondary markets while delivering maximum corporate visibility to the global securities and investment community. DTS8 Coffee Company, Ltd., is an established, artisan roaster, and distributor of gourmet coffees with a sales office and distribution center located in Shanghai and roasting facility located in Huzhou, China. For the nine months ended January 31, 2016, its sales from fresh roasted coffee decreased by 5.4%, which is inconsistent with growth in revenue it experienced for the year ended April 30, 2015. News sales initiatives have been introduced and expectations are for this to result in a return to its previously established revenue growth trend. Chinese consumers are now choosing coffee more by its origin country and flavor, rather than by brand, which is similar to the current trend of coffee consumption habits in Western countries. BCKT is currently trading at a $10 million market valuation. The recent developments have sent the stock price higher. The stock has gained over 150% (more than doubling and almost tripling) since the beginning of the year. DTS8’s recent acquisition agreement should spark new life into the company if it can re-establish its revenue growth. 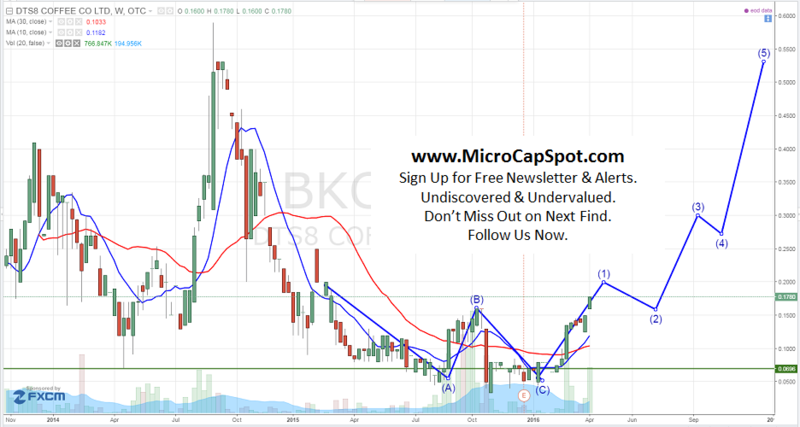 We will be updating on BCKT when more details emerge so make sure you are subscribed to Microcapspot so you know what’s going on with BCKT. Disclosure: we hold no position in BCKT either long or short at the publication of this article.